Novotel Bangkok Platinum Pratunam - Family & Business trip hotel - A Pratunam Hotel - what's around? A Pratunam Hotel – what’s around? A Pratunam Hotel - what's around? A Pratunam hotel that’s got it all! For all the shopaholics out there, Pratunam is the place to be! The number one must visit location when you’re in Bangkok. Better yet, why not stay a hotel in Pratunam to make life easier. Novotel Bangkok Platinum Pratunam is the hotel for you – situated above The Platinum Fashion Mall right in the middle of Bangkok’s fashion district. Staying in a Pratunam hotel answers for all kinds of trips, whether its business or leisure. Pratunam is one of Bangkok’s most lively areas, famous for its street markets, wholesale fashion factory outlets, bazaars and armies of local vendors. So what’s not to miss? Pratunam morning market kicks off at 5 am, this is the time when most of the locals do their wholesale shopping, meaning things are more calm and serious up until around 8am. Things can get busy after 9am with locals and tourists flowing in from everywhere in Bangkok. 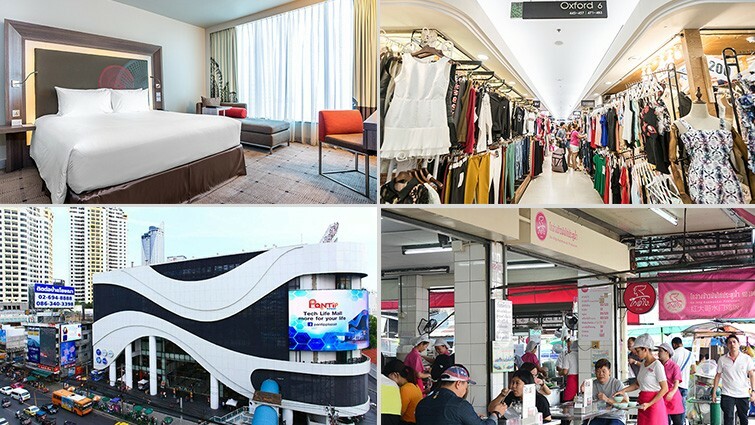 Opposite of Pratunam market, you will find the famous Platinum Fashion Mall where you will find all kinds of clothing, fashion accessories, shoes, watches, jewellery, belts, luggage and lots more. From Novotel Bangkok Platinum Pratunam hotel, you can walk to Central World Shopping Center through a sky walkway which will only take you a few minutes. Siam Paragon, Siam Center, Siam Square, MBK and the Neon market are also minutes away. Hungry? Why go anywhere else when you’re surrounded by local street food vendors – one of which includes the infamous Michelin guide Pratunam chicken rice. If you plan to visit places that are further away, the BTS Skytrain station is also minutes away and accessible through the sky walkway. Book here for special rates!